It’s not unheard of for a restaurant patron to sneak out with a spoon. But with a chair? And at the request of the host? Students in a product design class at the UO are encouraging diners to do just that on December 2, when the class, “Feast for Fifty,” invites community members to connect with student work over a shared meal. The food will be provided by Party Downtown and wine by Silvan Ridge Winery, but the students are making everything else—tables, chairs, glassware, ceramics, lighting, and textiles—and patrons get to take their entire place setting—even the chair—home afterward. “It's a crazy experiment—designing and making all the furniture, textiles, tableware, and lighting for a 50-person feast,” said Tom Bonamici, pro tem instructor of the Department of Product Design in the School of Architecture and Allied Arts. Above: Isabel McDowall removes air bubbles from a dinner plate in greenware phase. The plates were created by rolling out slabs of clay then formed over a mold cut to desired shape. Photograph by Amanda Kibbel. The 15 students in the class developed a wide range of skills over the course of the 10-week studio. They’ve also gained the rare experience of what is, in design-production circles, nearly instant gratification. The feast event adds another dimension to the students’ takeaway, she added. 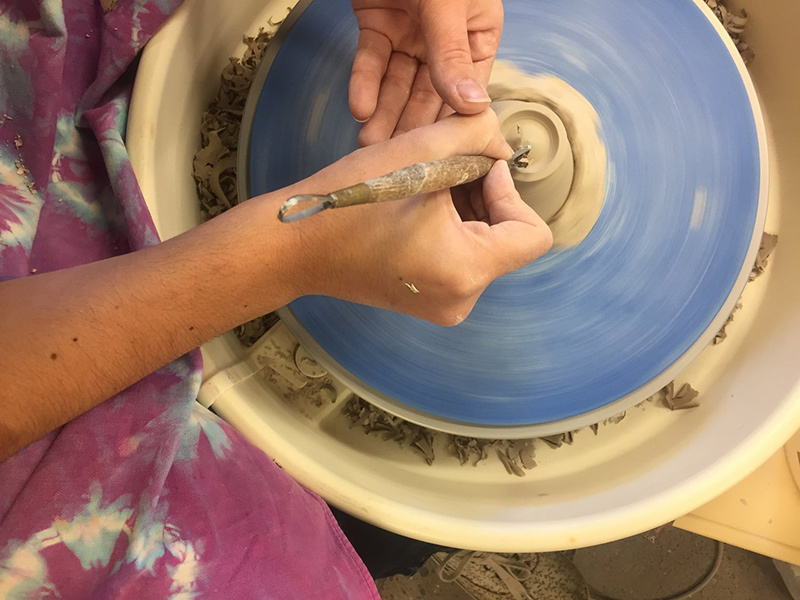 Students gained skills in ceramic slab building, glass blowing, mold making, woodworking, welding, sheet metal bending, fabric dyeing, hand weaving, sewing, and more over the course of the studio. “There's such a great diversity of fabrication that goes into a shared meal, and allowing that range of technique helped keep the class interesting and realistic,” Bonamici said. 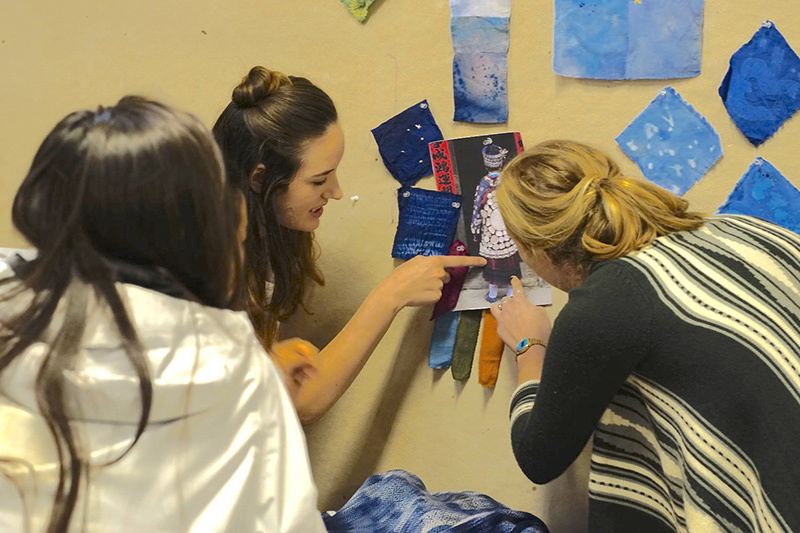 Above: Students examine dyed textile swatches against an inspiration image to help select materials for the feast. Photo by Natalie Thomas. While the feast doubles as a final critique of the students’ design accomplishments in the class, the students—all seniors—also see it as a summation of what they’ve gleaned overall in A&AA. Working under the same constraints as any professional designer “forces them to work creatively to find appealing, doable solutions,” Bonamici said. It also showed students just how intensely product designers work, and why. Proceeds from the nonprofit event will cover “the material costs of making it happen,” Bonamici said. Tickets for the event, which cost $110, sold out quickly. You can view photos of the event after December 2 on the Feast for Fifty website. 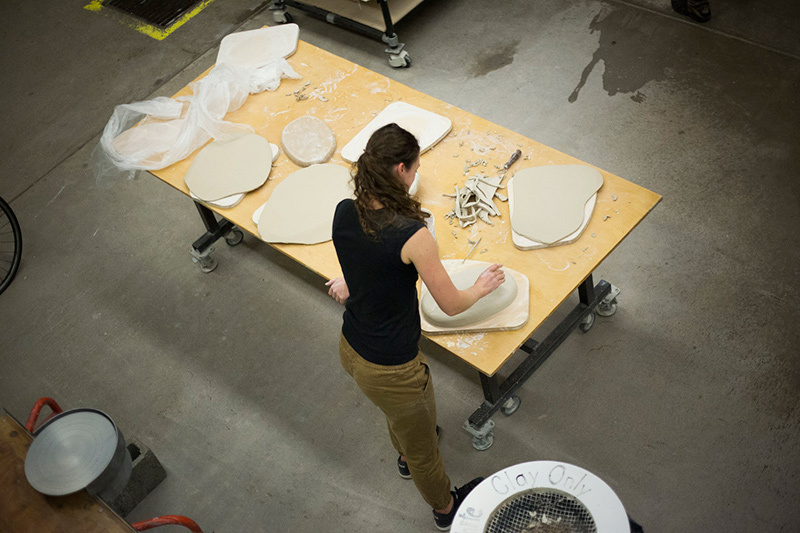 Above: A product design student works on ceramicware for the feast. Photo by Natalie Thomas. 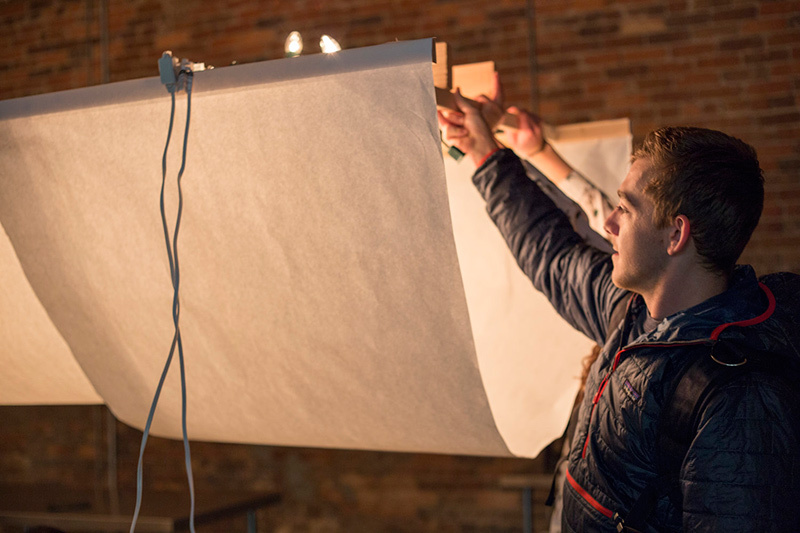 Above: Zach Meyer holds up one end of a prototype lighting installation while testing construction techniques and desired light strength. Photograph by Amanda Kibbel.